The number of jobs held by people of color and women in sports departments at newspapers and websites has improved slightly but remains low, with most positions dominated by white males, according to a study released Wednesday. 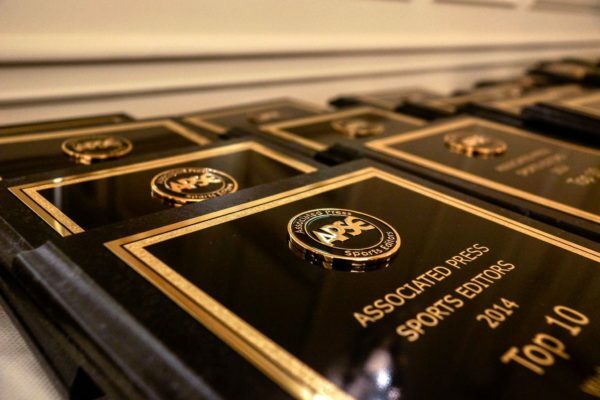 The report by Central Florida’s Institute for Diversity and Ethics in Sports issued the more than 75 outlets belonging to the Associated Press Sports Editors a second straight B grade for racial hiring, a D-plus for overall hiring practices and a fifth consecutive failing grade for gender hires in jobs that include sports editor, columnist, reporter and copy editor. Richard Lapchick, the director of the institute and the study’s primary author, said the percentages rose in nine of the 10 hiring categories — five each for racial hiring, five for gender hiring — that were studied. The report was the sixth on APSE since 2006 and the first since 2014. Typically a biannual study, it was delayed by two years because the group that publishes it had also undertaken several additional projects. The study found that while people of color occupy higher percentages of newsrooms than they did four years ago, white people continue to hold a significant majority of positions. According to the report, 85 percent of the sports editors, 76 percent of assistant sports editors, 80 percent of the columnists, 82 percent of the reporters and nearly 78 percent of the copy editors and designers last year were white. Also, news outlets received failing grades for gender hires in four of five positions — sports editor, columnist, reporter and copy editor — but did receive a C-minus grade in hiring assistant sports editors, of which 30 percent were women. The study found that 90 percent of sports editors and 88.5 percent of reporters were men. Of the 82 people of color who are either sports editors or assistant sports editors, 53 worked for ESPN. Of the 89 women who were assistant sports editors, 75 worked for ESPN, and of the 44 women who are columnists at what the study calls “A″ newspapers and websites, 38 worked for ESPN. The study was requested by the APSE, which Lapchick called “very encouraging.” He said the media organization is the only group to ask for a study from the institute that also issues regular reports on hiring practices in professional sports leagues and colleges and universities. “I think the (APSE) leadership wants to keep that spotlight on what needs to be done to make the sports media more diverse and inclusive, and I absolutely applaud the leadership for continuing to want to do this study,” he said. Lapchick once again recommended APSE consider formalizing a policy similar to the NFL’s Rooney Rule, which requires organizations to have a diverse pool of candidates, including women and people of color, for each key job opening.